Richard Hughes scored Portsmouth's winning spot-kick as they beat Crystal Palace in a penalty shoot-out in the second round of the Carling Cup. Edgar Davids, 37, was making his debut for Palace but saw his side go behind when David Nugent squeezed in a shot. The Eagles equalised through an Ibrahima Sonko own goal before losing Wilfried Zaha to a red card. Both sides missed penalties in the shoot-out before Hughes held his nerve to secure Pompey's win. The late spot-kick drama had started with Kieran Djilali failing to convert for Palace as team-mate Jonathan Obika also missed from 12 yards. And, although Tommy Smith's effort for Pompey was saved, Nadir Ciftci had the chance to be the home side's hero as he stepped up to take their fifth penalty. However, he missed and Carl Dickinson also failed to score his penalty in sudden death for Pompey after Nathaniel Clyne had his strike saved by home keeper Jamie Ashdown. Ashdown also saved from Adam Barrett before it was then left for Hughes to score the conclusive penalty. 134:35 The referee gets the match started. 127:00 Penalty scored by Richard Hughes. Portsmouth 4-3 Crystal Palace on penalties. 126:33 Penalty taken by Adam Barrett is saved by Jamie Ashdown. 125:34 Placed penalty taken by Carl Dickinson saved by Julian Speroni. 125:13 A save by Jamie Ashdown from penalty by Nathaniel Clyne. 124:26 Penalty missed by Nadir Ciftci. 123:55 Owen Garvan scores a penalty. Portsmouth 3-3 Crystal Palace on penalties. 123:32 Marlon Pack scores a penalty. Portsmouth 3-2 Crystal Palace on penalties. 123:09 Penalty scored by Patrick McCarthy. Portsmouth 2-2 Crystal Palace on penalties. 122:51 Placed penalty taken by Tommy Smith saved by Julian Speroni. 122:06 Spot kick missed by Jonathan Obika. 121:50 Penalty scored by Marc Wilson. Portsmouth 2-1 Crystal Palace on penalties. 121:34 Kieron Cadogan scores a penalty. Portsmouth 1-1 Crystal Palace on penalties. 121:22 Michael Brown scores a penalty. Portsmouth 1-0 Crystal Palace on penalties. 121:05 Placed penalty taken by Kieran Djilali saved by Jamie Ashdown. 120:01 The drama of the penalty shoot-out is about to begin. 120:00 The match goes to a penalty shoot-out. 119:30 Effort from a long way out by Richard Hughes goes wide right of the goal. 118:30 Corner taken right-footed by Michael Brown, save by Julian Speroni. 118:05 Attacking throw-in by Nathaniel Clyne (Crystal Palace). 117:34 Goal kick taken long by Julian Speroni (Crystal Palace). 117:23 Nadir Ciftci produces a left-footed shot from just outside the area that goes harmlessly over the target. 116:57 The ball is crossed by Kieran Djilali, save by Jamie Ashdown. 116:20 Goal kick taken long by Julian Speroni (Crystal Palace). Correction - 115:10 Matthew Parsons gives away a free kick for an unfair challenge on Marlon Pack. Cross/shot by Marc Wilson. 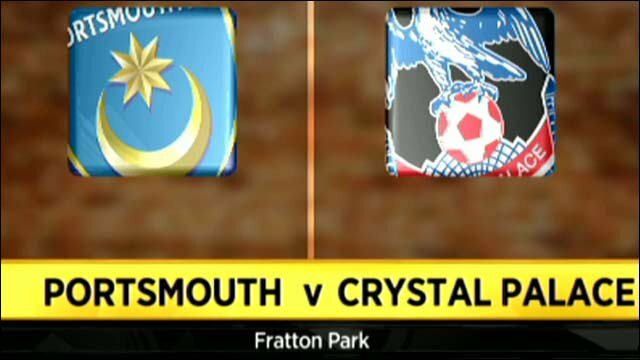 115:10 Foul by Matthew Parsons (Crystal Palace) on Marlon Pack (Portsmouth). Free kick taken Head by Marc Wilson (Portsmouth) from centre of penalty area (12 yards), over the bar. 114:52 Attacking throw-in by Matthew Parsons (Crystal Palace). 114:32 Defending throw-in by Matthew Parsons (Crystal Palace). 113:51 Goal kick taken long by Julian Speroni (Crystal Palace). 113:10 Goal kick taken long by Julian Speroni (Crystal Palace). 113:07 The ball is sent over by Carl Dickinson. 112:42 Goal kick taken long by Julian Speroni (Crystal Palace). 112:08 Unfair challenge on Richard Hughes by Kieron Cadogan results in a free kick. Free kick taken by Richard Hughes. 110:51 Corner taken right-footed by Joel Ward, Marc Wilson concedes a free kick for a foul on Patrick McCarthy. Julian Speroni restarts play with the free kick. 109:53 Nadir Ciftci takes the chance to get an effort at goal. Save made by Julian Speroni. 108:42 Defending throw-in by Nathaniel Clyne (Crystal Palace). 108:04 Goal kick taken long by Jamie Ashdown (Portsmouth). 107:51 Jonathan Obika has an effort at goal from outside the box which goes wide left of the goal. 106:34 Attacking throw-in by Nathaniel Clyne (Crystal Palace). 106:05 Unfair challenge on Jonathan Obika by Marc Wilson results in a free kick. Nathaniel Clyne takes the direct free kick. 105:01 The game restarts for the second half of extra time. 104:55 Nadir Ciftci takes a shot. Save made by Julian Speroni. 104:40 Attacking throw-in by Ibrahima Sonko (Portsmouth). 104:28 Goal kick taken long by Jamie Ashdown (Portsmouth). 104:10 Effort on goal by Kieran Djilali from just inside the box goes harmlessly over the target. 103:21 Adam Barrett takes the free kick. 103:21 Booking The referee cautions Nadir Ciftci for unsporting behaviour. 103:12 Nadir Ciftci gives away a free kick for an unfair challenge on Adam Barrett. 102:30 Free kick awarded for an unfair challenge on Owen Garvan by Marlon Pack. Free kick taken by Adam Barrett. 101:36 Attacking throw-in by Matthew Parsons (Crystal Palace). 101:36 Substitution Marlon Pack comes on in place of Hayden Mullins. 100:45 Unfair challenge on Alex Marrow by Marc Wilson results in a free kick. Free kick taken by Alex Marrow. 99:08 Adam Barrett concedes a free kick for a foul on Nadir Ciftci. Strike comes in from Marc Wilson from the free kick, Julian Speroni makes a save. 97:07 Corner taken right-footed by Tommy Smith, Marc Wilson gives away a free kick for an unfair challenge on Patrick McCarthy. Direct free kick taken by Julian Speroni. 96:13 Defending throw-in by Nathaniel Clyne (Crystal Palace). 95:00 Goal kick taken long by Julian Speroni (Crystal Palace). 94:44 Marc Wilson produces a right-footed shot from outside the penalty area and misses left. 91:48 Free kick awarded for an unfair challenge on Jonathan Obika by Hayden Mullins. Owen Garvan crosses the ball in from the free kick, clearance made by Aaron Mokoena. 91:36 Attacking throw-in by Matthew Parsons (Crystal Palace). 91:19 Attacking throw-in by Matthew Parsons (Crystal Palace). 90:31 Nadir Ciftci takes a shot from just inside the penalty box which clears the crossbar. 90:00+5:27 Effort from the edge of the area by Kieran Djilali goes wide of the left-hand post. 90:00+4:04 Attacking throw-in by Ibrahima Sonko (Portsmouth). 90:00+3:18 Defending throw-in by Nathaniel Clyne (Crystal Palace). 90:00+2:04 Goal kick taken long by Jamie Ashdown (Portsmouth). 90:00 The referee blows for the end of normal time. 89:19 Direct free kick taken by Julian Speroni. 89:19 Substitution Joel Ward is brought on as a substitute for Matt Ritchie. 89:19 Nadir Ciftci gives away a free kick for an unfair challenge on Adam Barrett. 88:38 Goal kick taken long by Julian Speroni (Crystal Palace). 88:23 Effort from outside the area by Michael Brown goes wide right of the goal. 87:33 Outswinging corner taken by Matt Ritchie, Jonathan Obika manages to make a clearance. 86:28 Goal kick taken long by Julian Speroni (Crystal Palace). 86:18 Attacking throw-in by Carl Dickinson (Portsmouth). 85:42 Jamie Ashdown takes the direct free kick. 85:42 Sent off Wilfried Zaha sent off. 85:33 Carl Dickinson fouled by Wilfried Zaha, the ref awards a free kick. 84:14 Free kick awarded for a foul by Tommy Smith on Patrick McCarthy. Patrick McCarthy takes the direct free kick. 82:00 Attacking throw-in by Nathaniel Clyne (Crystal Palace). 82:00 Substitution Edgar Davids goes off and Matthew Parsons comes on. 80:53 GOAL - Ibrahima Sonko:Portsmouth 1 - 1 Crystal Palace An own goal is conceded by Ibrahima Sonko. Portsmouth 1-1 Crystal Palace. 80:36 Kieron Cadogan produces a cross. 78:54 Inswinging corner taken by Matt Ritchie from the right by-line, Richard Hughes takes a shot. Blocked by Patrick McCarthy. 78:08 Defending throw-in by Carl Dickinson (Portsmouth). 77:25 Goal kick taken long by Julian Speroni (Crystal Palace). 77:10 Nadir Ciftci produces a right-footed shot from just outside the penalty box that goes wide left of the target. 76:55 Attacking throw-in by Nathaniel Clyne (Crystal Palace). 75:26 Jamie Ashdown restarts play with the free kick. 75:26 Booking Jonathan Obika goes into the book for unsporting behaviour. 75:18 Jonathan Obika challenges Jamie Ashdown unfairly and gives away a free kick. 73:51 Unfair challenge on Edgar Davids by Nadir Ciftci results in a free kick. Julian Speroni takes the direct free kick. 73:40 Attacking throw-in by Michael Brown (Portsmouth). 73:09 Goal kick taken long by Jamie Ashdown (Portsmouth). 72:32 The ball is swung over by Owen Garvan, Patrick McCarthy produces a header from inside the area that goes over the crossbar. 72:32 Booking Michael Brown is given a yellow card. 72:19 Free kick awarded for a foul by Michael Brown on Kieran Djilali. 70:40 Outswinging corner taken left-footed by Owen Garvan from the left by-line, Marc Wilson manages to make a clearance. Correction - 70:14 Kieran Djilali produces a cross, save by Jamie Ashdown. 70:14 The ball is crossed by Kieran Djilali, save made by Jamie Ashdown. 69:30 Attacking throw-in by Carl Dickinson (Portsmouth). 69:18 Attacking throw-in by Carl Dickinson (Portsmouth). 68:26 Long range shot by Alex Marrow goes wide right of the target. 67:46 Goal kick taken long by Julian Speroni (Crystal Palace). 67:46 Substitution (Crystal Palace) makes a substitution, with Kieron Cadogan coming on for Pablo Counago. 67:01 Inswinging corner taken from the right by-line by Matt Ritchie, Tommy Smith produces a left-footed shot from inside the six-yard box that clears the bar. 66:08 Corner taken left-footed by Owen Garvan from the right by-line, Jamie Ashdown makes a save. 66:08 Substitution Nadir Ciftci joins the action as a substitute, replacing David Nugent. 64:37 Carl Dickinson produces a drilled left-footed shot from 25 yards. Julian Speroni makes a save. 63:22 Effort from 25 yards by Tommy Smith. Save by Julian Speroni. 62:07 Goal kick taken long by Julian Speroni (Crystal Palace). 61:15 Corner taken left-footed by Matt Ritchie, clearance by Jonathan Obika. 60:29 Goal kick taken long by Jamie Ashdown (Portsmouth). 60:00 Inswinging corner taken by Owen Garvan from the right by-line. 59:18 Matt Ritchie takes a shot. Save made by Julian Speroni. 58:23 Richard Hughes restarts play with the free kick. 58:23 Substitution Andy Dorman goes off and Jonathan Obika comes on. 58:23 Alex Marrow challenges Michael Brown unfairly and gives away a free kick. 56:34 Assist by Richard Hughes. 56:34 GOAL - David Nugent:Portsmouth 1 - 0 Crystal Palace David Nugent grabs a goal from inside the box to the bottom right corner of the goal. Portsmouth 1-0 Crystal Palace. 55:30 Unfair challenge on Matt Ritchie by Nathaniel Clyne results in a free kick. Michael Brown crosses the ball in from the free kick, clearance by Adam Barrett. 54:28 Tommy Smith takes a short corner. 53:39 Goal kick taken long by Jamie Ashdown (Portsmouth). 53:21 Kieran Djilali has an effort at goal from outside the penalty area missing to the wide left of the goal. 52:32 The assistant referee flags for offside against Tommy Smith. Julian Speroni takes the indirect free kick. 52:16 Goal kick taken long by Julian Speroni (Crystal Palace). 51:14 Tommy Smith fouled by Edgar Davids, the ref awards a free kick. Free kick taken by Marc Wilson. 48:40 Tommy Smith concedes a free kick for a foul on Edgar Davids. Free kick taken by Edgar Davids. 47:57 Inswinging corner taken right-footed by Andy Dorman played to the near post, clearance made by Tommy Smith. 47:34 Corner taken by Andy Dorman from the left by-line, Hayden Mullins manages to make a clearance. 47:12 Wilfried Zaha takes a shot. Jamie Ashdown makes a save. 45:55 Short corner taken by Owen Garvan. 45:35 Free kick awarded for a foul by Edgar Davids on Michael Brown. Direct free kick taken by Marc Wilson. 45:00+0:31 Free kick awarded for an unfair challenge on Kieran Djilali by Hayden Mullins. Direct free kick taken by Kieran Djilali. 43:13 Inswinging corner taken left-footed by Owen Garvan from the right by-line to the near post, clearance by Tommy Smith. 42:19 Attacking throw-in by Ibrahima Sonko (Portsmouth). 40:44 Owen Garvan challenges Marc Wilson unfairly and gives away a free kick. Marc Wilson restarts play with the free kick. 38:19 Defending throw-in by Carl Dickinson (Portsmouth). 37:41 Goal kick taken long by Julian Speroni (Crystal Palace). 37:23 Matt Ritchie produces a drilled left-footed shot from 35 yards that went over the crossbar. 36:38 David Nugent challenges Edgar Davids unfairly and gives away a free kick. Edgar Davids restarts play with the free kick. 36:34 Goal kick taken long by Julian Speroni (Crystal Palace). 35:39 Effort on goal by Andy Dorman from inside the penalty area goes harmlessly over the bar. 35:04 The ball is swung over by Richard Hughes, save by Julian Speroni. 34:26 Corner taken left-footed by Matt Ritchie from the right by-line, clearance made by Alex Marrow. 33:15 Goal kick taken long by Jamie Ashdown (Portsmouth). 32:57 Kieran Djilali produces a right-footed shot from the edge of the box and misses to the right of the target. 32:01 Michael Brown challenges Kieran Djilali unfairly and gives away a free kick. Direct free kick taken by Julian Speroni. 30:52 Goal kick taken long by Julian Speroni (Crystal Palace). 29:43 Attacking throw-in by Ibrahima Sonko (Portsmouth). 28:56 Centre by Wilfried Zaha, Shot from inside the area by Pablo Counago clears the bar. 27:48 Goal kick taken long by Jamie Ashdown (Portsmouth). 27:26 Owen Garvan takes a corner. 26:45 Owen Garvan takes a shot from just outside the penalty area clears the crossbar. 26:16 Free kick crossed left-footed by Owen Garvan, Hayden Mullins makes a clearance. 26:16 Booking Marc Wilson goes into the referee's book. 26:04 Marc Wilson concedes a free kick for a foul on Wilfried Zaha. 25:45 Michael Brown challenges Andy Dorman unfairly and gives away a free kick. Andy Dorman takes the direct free kick. 24:36 Owen Garvan fouled by Richard Hughes, the ref awards a free kick. The free kick is swung in left-footed by Owen Garvan, Aaron Mokoena manages to make a clearance. 22:39 Owen Garvan crosses the ball from the free kick left-footed from right wing. 22:39 Booking Owen Garvan is cautioned by the ref for dissent. 21:59 Carl Dickinson concedes a free kick for a foul on Wilfried Zaha. 21:26 The referee blows for offside against Tommy Smith. Indirect free kick taken by Adam Barrett. 16:55 Edgar Davids crosses the ball. 14:05 Attacking throw-in by Nathaniel Clyne (Crystal Palace). 12:17 Goal kick taken long by Jamie Ashdown (Portsmouth). 11:59 Attacking throw-in by Nathaniel Clyne (Crystal Palace). 10:46 Defending throw-in by Nathaniel Clyne (Crystal Palace). 10:05 Inswinging corner taken by Matt Ritchie. 8:32 The ball is swung over by David Nugent, Edgar Davids makes a clearance. 7:15 Inswinging corner taken left-footed by Owen Garvan from the right by-line to the near post, clearance by Hayden Mullins. 6:28 Defending throw-in by Carl Dickinson (Portsmouth). 4:54 Edgar Davids challenges Tommy Smith unfairly and gives away a free kick. Marc Wilson shoots direct from the free kick, save made by Julian Speroni. 2:22 Corner from the right by-line taken by Owen Garvan, Aaron Mokoena manages to make a clearance. 0:55 Attacking throw-in by Hayden Mullins (Portsmouth).